Clients often ask about the construction of our suits, so here are some insights into the making of an Oscar Hunt jacket (saving you the trouble of tearing yours apart). The foundation of all Oscar Hunt jackets is the lightweight cotton, mohair and horsehair blend canvasing procured from Germany. Our jackets are constructed with a floating canvas through the shoulder and chest. A floating canvas is sewn into the lapel and armhole to be soft and form fitting to the body. All layers of canvasing are constructed with natural fibres so the jacket can breathe and shape correctly. The left image above demonstrates the three layered canvasing throughout our jacket shoulders and chest. 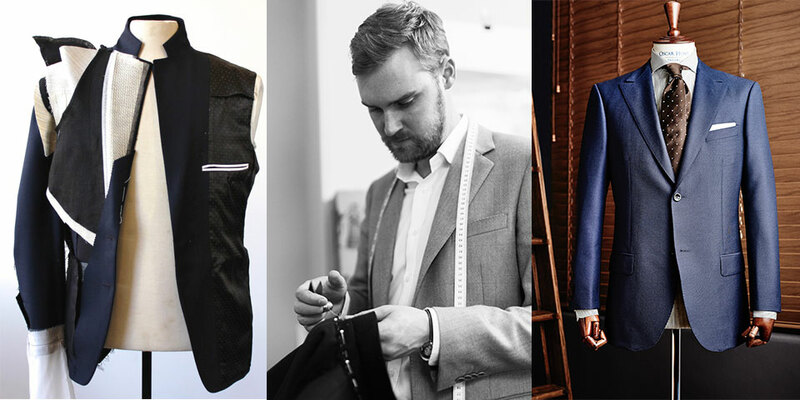 There are many construction options available in the suiting industry. Oscar Hunt uses half or full canvasing rather than a fused option, as fusing reduces manoeuvrability, breathability, shape and overall longevity. Fused jacketing is a lower quality construction where the inner canvass is glued to the chest resulting in a stiff, inflexible garment and removing the natural qualities of the cloth. The inner workings of a jacket need to perform correctly in order to smooth any body imperfections, whilst still being comfortable and complimentary to your silhouette. Note: Canvas variations and soft tailored unstructured suits are also available at Oscar Hunt. If you would like to know more information about our suits please contact us via custom@oscarhunt.com.au or call our Melbourne showroom on 03 9670 6303 or Syndey showroom on 02 8097 2470.